Hello Cheapo Dies Fans!! 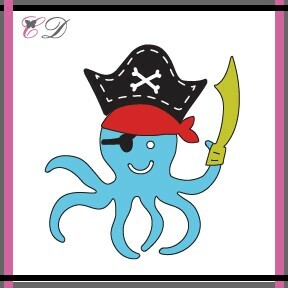 Lori here today with a card I made with the Exclusive Cheapo Dies Pirate Octopus die. This is such a fun die to work with!! For this A2 card I started with white card stock for the base of the card. I took a piece of water paper, inked the edges with Salty Ocean distress ink and added it to the card. I took some red paper to cut out the Pirate Octopus die. I took a scrap of black paper to make the eye patch, eye and smile. I then took a scrap of red paper to make the scarf and a scrap of black glitter paper to cut out the pirate hat. I cut out the crossbones with a scrap of white paper and inlaid that into the pirate hat. I used some silver paper and black paper for the sword. 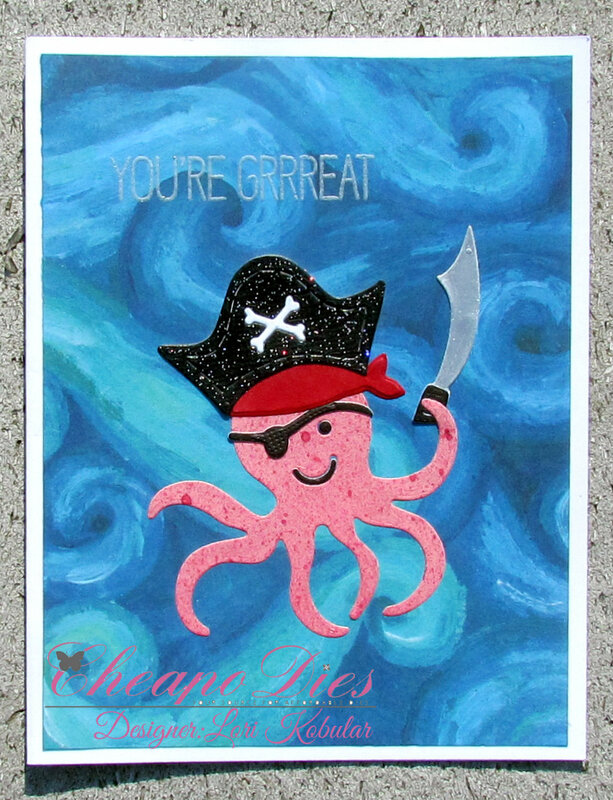 I attached the Pirate Octopus to the card and then took some Versamark and stamped the sentiment onto the card and then heat embossed it with Silver embossing powder. Be sure to stop by the Blog everyday to see more wonderful creations made by the Design Team!